There are several social gatherings held throughout the year. These gatherings always include food and sometimes adult beverages. When club members attend a race in mass, we try to schedule a post-race breakfast or lunch gathering at a nearby restaurant or pub. The club also holds a holiday party every December. These events are always announced through the club email system. Started in 1990 by Dean Shonts of the Sneaker Factory, the Great Swamp Devil 5K & 15K races were handed off to Amazing Feet in 2011. AFRC is now the official running club sponsor of these races which are held in October on Lord Stirling Road in Basking Ridge, NJ. The races benefit The Lord Stirling School, a non-profit day school for pre-adolescents and adolescents who have not succeeded in mainstream education. Club members are asked to volunteer to support the races. 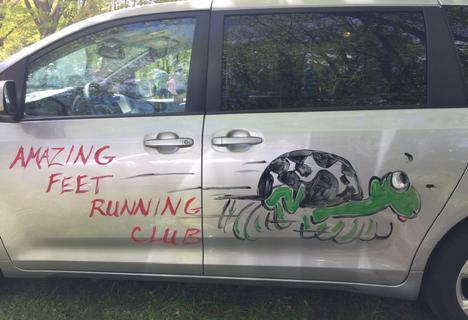 After the races are completed, one of our club members generally hosts a party at her home, which is within walking distance from the Finish Line. It's a great day of giving back and having fun. Every spring the club supports The Legal Runaround 5K in Somerville, NJ. The race is held on the Thursday evening prior to Memorial Day weekend as part of the Tour of Somerville cycling festivities. AFRC members serve as course marshals to keep runners on course and motivated. Food is provided by Verve restaurant for volunteers and runners. It's a wonderful event presented by the Somerset County Bar Foundation and it benefits several organizations dedicated to helping children. In mid-December each year, the club holds an informal Jingle Bell Fun-Run for club members only. Members feeling jolly sport their bells, antlers and lights, just to name a few! We run through the town of Basking Ridge and finish up with dinner at Ridge Restaurant & Pizza. The run is very informal and great fun! Many club members are active marathon and ultra marathon runners. If you're considering running in one of these events, ask around or e-mail the club membership. Not only can you can get some great training tips and race day advice, you can find club members training for the same type event. Many of our major "long runs" are held in the spring and fall, so ask around and you'll find partners to run with. AFRC encourages membership in USATF-NJ (www.usatfnj.org). In addition to supporting the sport of running, your membership will entitle you to registration discounts and prizes in some races. "Marathoning is just another form of insanity."